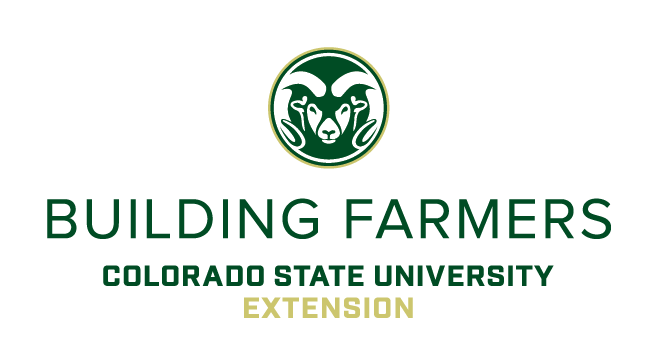 In 2007, Colorado Building Farmers (CBF) began as a CSU Extension program in Boulder County through a Western SARE Mini-Grant, CSU Extension Innovation Grant and support from Boulder County Parks and Open Space and the Boulder County Farmers Markets. CBF expanded into four regions in 2009 with a grant from the Western Center for Risk Management. In 2010, CBF received funds from the USDA Beginning Farmer and Rancher Development Program and became a multi-state program, Building Farmers in the West (BFW), with similar classes being offered in Colorado, Utah, New Mexico, Nevada, Washington, Oregon, and Idaho. In 2012,Building Farmers in the West received a second grant from the USDA Beginning Farmer and Rancher Development Program to continue programming in Colorado, Idaho, and Utah and to expand proramming to Arizona and Wyoming through 2015. Building Farmers in the West has received two grants from the USDA Beginning Farmer and Rancher Development Program. These funds supported programs in Colorado, Utah, Arizona, Wyoming, New Mexico, Nevada, Washington, Oregon, and Idaho. In 2009 the Western Center for Risk Management provided a grant to expand Colorado Building Farmers across the state of Colorado and to refine the core curricular foundation for all Building Farmers in the West programs. As of May 31, 2012, Colorado Building Farmers had reached over 300 producers across the state. Given feedback from community resource partners who worked with previous program participants in Colorado, we expect at least 10% (40 participants) will have made such significant progress on their business plans that they will be able to acquire additional capital (land, water, financing), establish new markets (farmers markets, CSAs, restaurant accounts, Farm to School), or complete the requirements to participate in government programs (FSA beginning farmer loans, Value-Added grants, NRCS programs) within 18 months of completing the course. As of May 31, 2012, Utah Building Farmers had reached 48 producers across the state. Pre-course and post-course evaluations show that participants made the greatest improvements in accessing local resources/technical support, developing business plans, and using effective merchandising at direct markets. As of May 31, 2012, Building Farmers had also reached 22 producers in Idaho, 24 in New Mexico, 23 in Orgeon, 11 in Nevada, and 19 in Washington. 1. Develop well-targeted curriculum and decision tools for smaller-scale commercial farmers and ranchers. a. Short courses at the introductory level (Principles of Business Planning and Management) for those in their first years of operation, who are still exploring the possibility of establishing a farm or ranch, or those working for existing operations who are considering investments in their own operation. The program will continue to use delivery methods that allow for hands-on learning, integrate producer instructors, and encourage community building among producers, community partners and University instructors. b. Advanced Classes for those who have earned certificates from the base program (Principles of Business Planning and Management).Additionally advanced producers who have not completed the Principles class may make competitive application to take these Advanced Classes. These programs will focus on key topics in business management (defined as those that require more rigorous analysis or detailed background information) and Developing Yourself as an Ag Business Leader (focused on leadership and management skills). 3. Provide enhanced experiential learning opportunities for those short-course participants who complete a solid business plan (or other planning deliverable) after taking the Building Farmers class series. 4. Offer Technical Assistance Mini-grants for professional consulting services to Building Farmers program graduates and advanced beginning farmers. 5. Evaluate the materials, course approaches, producer outcomes, and long-term sustainability of our Building Farmers technical assistance programs. 6. Explore a Colorado Land-Link program with Guidestone.